(the "gardens of William Morris" at the Red House, Bexleyheath. I've had several occasions lately to ponder what makes a historic garden 'real'. In less transient forms of art, made in the comparatively eternal (to gardens at least) mediums of paint and stone the difference between a 'real' and a 'fake' can be readily distinguished and doesn't change over time. What is done by Picasso is always Picasso. But if Picasso made a garden, and it fell into disrepair, and a hundred years later (or two or three) it was re-created, is it still a Picasso? But the task of the garden historian is, perhaps even more than to renew or replant or re-imagine, to re-interpret, because in the garden art as in all others there is no point but to be understood. A plant may be appreciated, even experienced, but a planting scheme can be understood, and a delicate bridge formed to the past--swaying though it may be with uncertainty--to the designer of the scheme and the owner of the house and their fashions and failings and taste and their reasons for being and planting the garden. Why make a garden? Why re-make one? The difference between an homage and a forgery--a fake--is what the work is said to be. The student who paints a 'Picasso' to learn a style is simply admiring until he claims that his own hand is that of his master. The best way to keep a historic garden real is to simply be honest about what is known and what is not, and what has been changed or altered or remade. Too often at historic properties the fact that the garden isn't completely "real" is treated as an unsavoury secret, offered up--a bit shamefacedly--by a guide only when the visitor enquires, as if in some sort of admission of guilt. The missed opportunity is to interpret the past by celebrating its renewal, uncertain as that may be. Of course they should plant yuccas there. Ahistorical history is not history. It is not our job to assume that our "taste" is superior to what actually happened in a garden. If a garden is a complete fabrication on a historic site, it is simple to pick a period to recreate & announce it. Or one may depict the garden's change over time by demonstrating & explaining those changes throwing in a little social history on the side. As for the yuccas in Tulsa, seems like the right thing to do, even if the hardscape is borrowed from Italian history. What a good post. They seem to be having the same thoughts about Great Dixter. 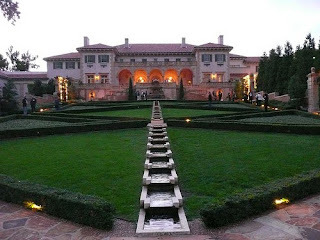 The gardens at Philbrook are lovely but a bit overwrought in some places. Yucca might be a welcome contrast. As for putting in yucca just because they were there at one time - it seems unimportant to put in something that was fashionable then - because it was no doubt a new find at the time. Gardens are tricky, aren't they? You can play Baroque music on original instruments, but even if you have a tree that survives from the period it won't look the same as it did then! I think it's important to be clear about what you are doing. Historical records are rarely precise enough to allow an exact recreation of a garden. The closest is probably something like the 19th-century vegetable garden at Vaucluse House in Sydney. It's on almost the same spot and grows varieties known to be available in Sydney in the 1840s -- but the curator will tell you that it is on *almost* the same spot and why. It's fakery that is a problem: when you don't know what's based on research and what isn't. This is a fabulous blog and ultimately a really important voice in discussions on gardening. I think Bob Marley said it best, "If we don't know our past, we don't know our future." Right? Great job Arcady. Love the comments too. Personally, I'm for the yucca even if it is a a post-modern affectation. Gardens are very tricky indeed - even for gardens that are of less note. I just attended a 'memorial party' for a gardener, in the garden that she had not tended for nearly 10 years. It is still tended by the garden helper, but when the invitation came he said the garden was 95% as it was. He was wrong. A garden cannot - will not - stay the same, even from year to year under the hand of the same gardener. I don't know what that means for those who care for great or 'historic' gardens.